Standing center stage in Portland's Merrill Auditorium in a slim-cut blue suit with red tie and matching socks, James Kennerley is looking around the empty concert hall. Portland's newly hired municipal organist - the city's 11th - is not imagining all 1,900 seats filled with cheering organ music lovers. He has a more immediate need demanding his attention. Standing in the tight quarters of his workshop in Topsham, Jimmy Cox takes out one banjo after another, holding each as if it were an extension of his own body. In a way, they are. 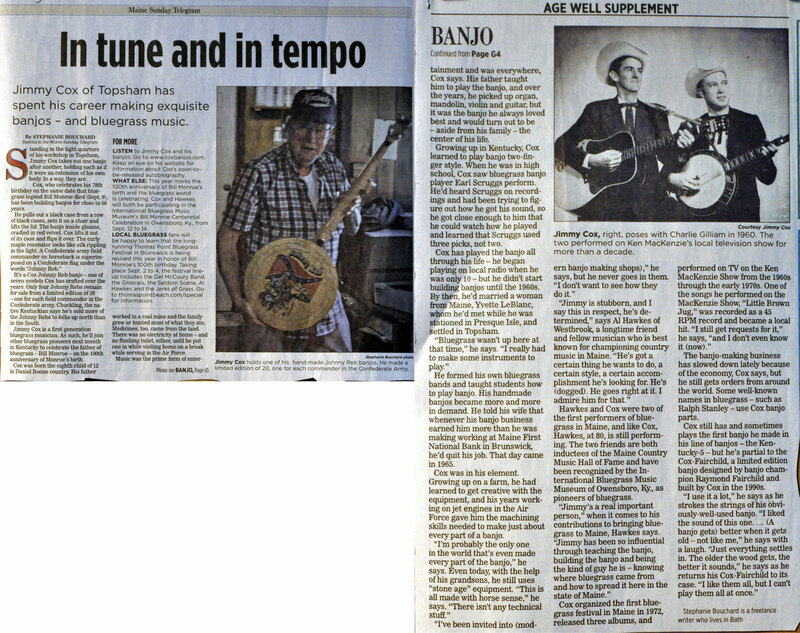 Cox, 77, has spent his career making exquisite banjos and bluegrass music. Sometimes Jeff Daniels will be in the middle of a concert and he'll think to himself, "This is like a mini-Broadway musical." He acts, he sings, he plays guitar. What many people may not be aware of is that Daniels has had a decades-long love affair with writing and performing his own songs. Like most mothers who are proud of their children, Luana Smith of Bowdoinham wants everyone to know how and what her son, Carter, is doing. Unlike most mothers, Smith doesn't just tell her family, friends and neighbors. She tells Maine's most famous horror author -- a man she doesn't know personally.